I’ll be the first to admit that professional conferences aren’t exactly my thing. The natural introvert in me gets tested, and I’m always exhausted by the conclusion of the conference. This being said, I almost always find value in them and upon reflection, am grateful I attended. I write this because 1) I wasn’t really looking forward to attending SIOP 2019, 2) had a great (!?!) conference, and 3) I’m really looking forward to attending in 2020. My colleague Maria Brown and I headed to the DC area last week for the the 34th annual Society for Industrial and Organizational Psychology Conference. We were immediately met with a cabbie who was unusually grumpy due to the demanding tourists of DC’s cherry blossom season. Happily, he was elated we weren’t putting him through another 2.5 hour drive into the city, instead heading to the Gaylord National Resort & Convention Center in National Harbor. It was a great space for the conference and one I would certainly return to. I/O is a field where research (i.e., science) is often conducted in academic settings. The findings from that research, however, need to be transported into the applied world (i.e., working organizations). Here’s the rub: often, what’s found to be important and useful through research is difficult to implement inside actual organizations. Thus, a gap frequently exists between what science says should be done and what is actually happening in practice in the field. I’m not going to say it’s Capulets vs. Montagues, but there are certainly some spirited debates between I/O psychologists who are primarily in the research world and those who are primarily in practice. As a “practicing scientist” – and to satisfy my own curiosity – I attended several sessions discussing the scientist/practitioner gap within I/O psychology. These sessions focused on why the gap exists and what can be done to curtail it. There is no easy answer to this dilemma. Probably compromises need to be made on both sides of the aisle. At MRG, we strongly feel that bringing the best science to the table is critical, while balancing those organizational nuances that can make implementation tricky. Another big theme across SIOP 2019 revolved around technology: its place in our practice and how it is changing what we do. From cyber security, to mobile assessment, to utilizing gaming technology for assessment, many sessions had a technology tilt to them. SIOP has grown to such a large extent over the years though, that you could find a session on just about any topic if you hunted long enough. 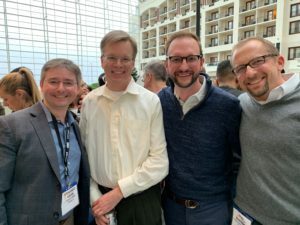 The author (second from right) connected with fellow Illinois Institute of Technology grads Fernando Arena (left) and Dave Sowinski (right), along with IIT’s new I/O program head, Scott Morris. Just as it does every year, SIOP also presented a great opportunity to catch up with clients, friends, and professors. It’s wonderful to see those you work (or worked) closely with, but don’t actually see that often. For that, I’m quite thankful for the opportunity to continue those relationships. SIOP 2020 is to be held in Austin, Texas. and Maria and I are already putting on our thinking hats in terms of what we’d like to propose. We’ve also vowed not to leave it until the last minute! That September submission deadline always seems to sneak up on us. If you’re reading this and would like to partner in a submission, or just have an idea you want to explore, please let me know – we’d love to collaborate!